Everyone on TV nodded their head. Why not. The man is bigger than Jesus. But listen, WB (we call each other by our initials when we whisper softly to each other) charges for insurance AGAINST NUCLEAR ATTACKS. If I were a door to door life insurance salesman you know what I would say to you? You can die tomorrow! Why not protect your kids just in case? And I don’t like when people, even Buffett, spread nuclear panic. But I forgave him. We hugged it out. Sort of. He never met me. And he wouldn’t pick up the phone the one time I called him. But I took a cab to his house. Hey, wouldn’t you take a cab to his house? If you could? I went to the 2003 annual meeting in Omaha. The Buffettpalooza. I think 20,000 people were supposedly there. No exaggeration. People got on line at 5am to get into the meeting. Krispy Kreme donuts were served on the line outside. Then, when it was time to go in, everyone RAN in order to get a good seat. But since they had just cleaned the floors everyone was slipping, falling, sliding as soon as they got into the building. It was exactly what would happen if everyone was running to escape, well, a nuclear attack. The night before the meeting there were some parties. I got invited by pretending to be “media”. I got a special badge. One guy had some numbers written on a napkin. “What do you think Berkshire’s ‘intrinsic value’ is?” he asked me. He had all the parts of Berkshire written on a napkin with numbers written next to them. If you didn’t know it, this is referred to as “back of the napkin” investing. I met another guy who told me a story. He bought 200 shares of Berkshire in 1976. The shares doubled in a year or so and he got nervous. So he sold 100 shares and used the proceeds to start a restaurant. The other 100 shares (assuming he still holds them because he told me he was never going to sell them) are now worth $18,000,000. So its safe to say that this guy I was speaking to is the world’s greatest investor ever. He bought 100 shares. Never had to even think again. About anything. He could’ve watched MTV and eaten nothing but Pringles for the next 35 years. And now he’s got $18,000,000 in the bank. But he has big regrets. Because he sold those other 100 shares on only a double. Oh well. We have some work to do here. Because its not easy to find unusual things about Warren Buffett. 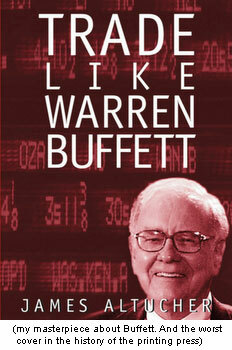 But if you didn’t notice the picture above, I wrote THE book on Warren Buffett. The one book that’s not even mentioned in the exhaustive list of books mentioned on buffett’s Wikipedia page. 2) His worst investment ever. I asked this question on Twitter earlier. I said, “he lost his self-esteem and 20% in that order.” Everyone came back with very smart responses: Conoco Phillips, where he lost $1 bb (but not 20% of his net worth (not even 2% of his net worth) and certainly not his self-esteem). The Berkshire Hathaway business itself was a bust. 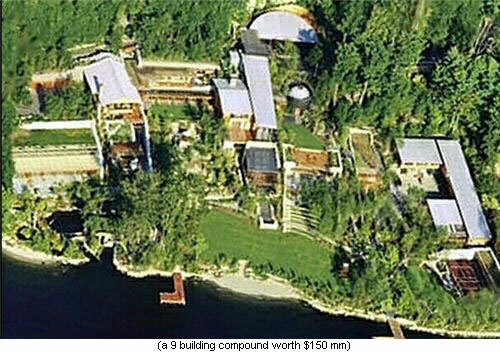 But the stock zoomed and Buffett made the bulk of his net worth on Berkshire Hathaway. No, the answer is a Sinclair gas station he bought in 1951 with a friend of his. On the weekends he’d even squeegee people’s windows. But the Texaco station right across the street destroyed him. He lost $2000, when his savings was about $9600 at the time. He put a lot of work and love into that little baby and it all went down the drain. But that experience probably gave him the desire to have a more passive management style. A style he later mastered at Berkshire. 3) He was rejected from Harvard Business School. If you think about it, Harvard must have a pretty bad reputation by now. Bill Gates and Mark Zuckerberg hated it so much that they dropped out. And the one time they could’ve landed the best businessman ever, they rejected him. Like most smart people, Buffett didn’t even really want to go to college. He started out at Wharton but then switched back to his hometown college in Omaha because he didn’t like it. Then, after being rejected by the best business school in the country, he went to Columbia. 4) He was a victim of reverse anti-Semitism. When he originally wanted to work for his mentor Ben Graham, on Wall Street, Graham said, “no”. Buffett was shocked and asked why. Graham told him it was because he wasn’t Jewish. Graham wanted to save a spot in the firm for a Jewish person. To be fair, Graham was worried that Jews couldn’t be hired anywhere else on Gentile Wall Street so he wanted his firm to be Jewish-friendly. The key to success though is persistence. Buffett went back to Omaha but kept pitching ideas to Graham until Graham eventually hired him. Persistence is the only sure-fire method for obtaining success. 5) Adam Smith. Its useful to look at the history of the field you want to master. When I was trading for Victor Niederhoffer I saw that he had collected just about every finance book from 1800 on. So I started reading books anywhere from 100 to 30 years old just to see what people were thinking and how finance and trading had evolved. Obviously, that investor was Warren Buffett. But Smith didn’t know then that he was dealing with WARREN BUFFETT because he wasn’t in all-caps yet. 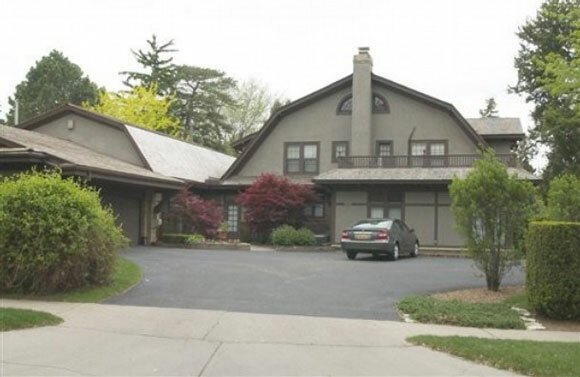 And, in fact, many years later Buffett did buy that furniture store. I thought Supermoney was fascinating for its predictive abilities. How could Smith know that Buffett would be the best investor to profile? In the next profile after Buffett , Smith wrote about a guy who was sitting in a Swiss jail. If you screw up a bank in Switzerland you are going to jail, no get-out-of-jail free cards. What was this guy doing while in jail? Trying to write some fiction. That’s where the profile ends. Paul Erdmann went on to become the bestselling finance thriller writer ever. I highly recommend his novels. In any case, it’s a great chance to see how someone described Buffett before he became BUFFETT. I mentioned this to Pamela van Giessen at Wiley (see Why I Still Write Books Even Though I’ve Lost Money on Every One of Them) and she ended up republishing the book as a Wiley Investment Classic. I give myself full credit on that one even if she disagrees with me. 6) The SEC investigated Buffett in 1974-1976 for manipulating penny stocks. This was a serious charge. And Buffett takes his reputation seriously. And the reality is (I won’t get into details but Janet Lowe covers it here), he WAS manipulating penny stocks and he sort of admits it. But he had a good reason. He was buying a company and he promised a shareholder of the company that the price wouldn’t be lower than a certain number. So he made sure the price of the penny stock never fell below that number. Or something like that. If I got the details wrong, Warren, you can put a gun to my head and fire the bullet. Suffice to say, the SEC didn’t know what to do with someone like Warren so they slapped him on the wrist (some historical versions say “the face”) . He admitted nothing but one of his companies paid a $115,000 fine. He plays bridge 12 hours a week (I guess he uses a computer at home for this). 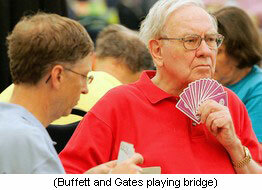 Bill Gates is often his bridge partner. But, one thing struck me as interesting. The annual meeting is about eight hours long. I don’t recommend it to anyone. I can’t remember anything he said except one thing. Actually I remember something Charlie Munger (Buffett’s number two) said. Something to the effect that long-term you better bury all your guns and valuables in the backyard and at that point Buffett shut him up.